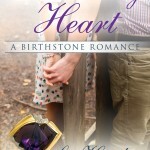 Liz Hartley | Birthstone Romances: Because every woman has a birthstone. The color of this amethyst is extraordinary. 18k yellow and white gold pendant design by Deborah Spencer, Trios Studio, Lake Oswego, Oregon. 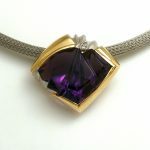 John Dyer is one of several gemstones artists who have taken cutting to another level. 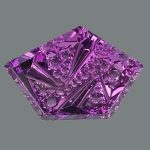 This 68.49 carat amethyst is one of his Dreamscape™ series. Photo courtesy John Dyer & Co. Draft of The Listening Heart Done! Finally! 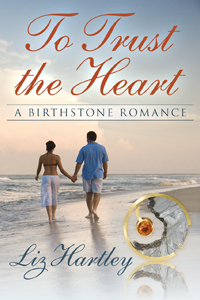 The second book in my Eden Beach birthstone series, The Listening Heart, is done and out to beta readers. It’s taken a lot longer than I thought. From some of the comments coming in, it will take a bit longer yet as I make it stronger. I’ve added a suspense element to this one, and that has made the pacing trickier. This one has a stalker/serial killer who is shadowing my main female character, Stacie Capella. I’ve already had one friend tell me she won’t read it and that’s fine. But I wanted to try something darker. Not sure I’ll try it again, but I’ll have to wait and see. 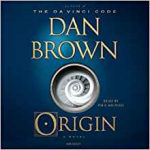 Now, on to book three as I wait for the rest of the comments from beta readers. I’m determined this one will get done faster. Bananas. 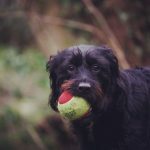 I’m ready when you are! Photo Stuart Robertson/Dreamstime. Happy Valentine’s Day! A day for hearts, flowers, chocolate, and, of course, love. One tiny section of the vast Tucson Gem and Mineral Show in Tucson, Arizona. This is the Tucson Convention Center. Where do you even start? Photo Derrick Neill, Dreamstime. If you need a reason to own your emerald birthstone, besides the beautiful color and rich history, you might think about its self-improvement properties. Hope Spinel. 50.13 carats. Photo courtesy Bonhams. Practically everyone has heard of the Hope Diamond, the large, blue, supposedly accursed diamond now in the Smithsonian Institution. 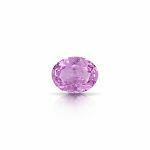 But a couple years ago, the London office of the auction house Bonhams sold the 50.13 ct. Hope Spinel, presumably un-cursed. Spinels have been largely unknown among mainstream gemstone customers. Even those who had heard of the stones thought of them as lesser versions of rubies and sapphires, two gemstones that share colors with spinels. Part of the problem in the past was that spinel supply was often spotty and undependable. Many historical stones came from Tajikistan, at the border of Afghanistan, geographically difficult and often politically dangerous to get to. 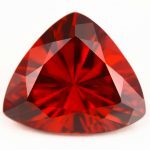 But in 2007, there was a find of red spinel in Tanzania that flooded the market with top quality stones and people started to notice. 3.78 carat red Burmese (Myanmar) spinel. Photo courtesy Gemcal. Spinel-producing regions tend to have their own peculiar color range, according to Hemi Englisher owner of Gemcal Co. Ltd, in Bangkok. Burma (Myanmar) produces “the best reds in the world,” pink, purple, Sienna orange, brown, blue, gray, and colorless stones, he says. From Vietnam: orangey red, blue, cobalt blue, baby pink, “the best lavenders in the world,” and purple. From Tanzania: pink, pinkish red, and red stones that “tend to be slightly foggy or silky.” Small gray and silver material comes from Madagascar. Blue, lavender, change color, and purple stones, “most with a dark shade to them,” are produced by Sri Lanka. 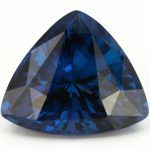 4.68 carat cobalt blue Ceylon (Sri Lanka) spinel. Photo courtesy Gemcal. 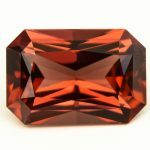 5.48 carat Burmese Spinel, cinnamon color. Photo courtesy Gemcal. There is a lot to love about peridot, but because color is such a personal thing, I can imagine there are people who don’t love its yellow-green color. But you can still have a birthstone to love! 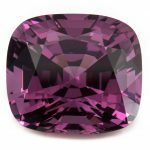 Because last year, the American Gem Trade Association (AGTA) and Jewelers of America (JA) announced the inclusion of spinel as an official birthstone for the month of August. 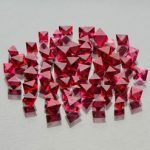 Red spinel crystals. Photo courtesy ThaiLanka. Okay. My bias is going to show here. 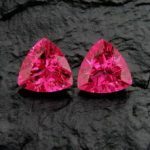 But when it comes to spinel, I think it’s one of the most under-rated and under-used stones in the jewelry industry. Part of the reason for that is because it’s not as common as, say, garnet or tourmaline. But to have a stone that is beautiful, is rarely treated, is extremely durable (it’s an 8 in hardness and has little to no cleavage risk), that comes in a luscious range of reds, pinks, purples, oranges, and blues, and to make little use of it is, well, spine(l)less! (Sorry.) Just a few of the gorgeous possibilities are pictured here. 10.25 carat purple spinel from Burma/Myanmar. Photo courtesy Gemcal. Neon pink spinel. Photo courtesy ThaiLanka. You know they’re beautiful when enormous spinels found their way into the Crown Jewels of England and were, for many years, paraded as rubies. (I wrote a little about this last month.) But the range of subtle color is what really makes them great as a birthstone. You could can choose just one luscious spinel from a range of reds, oranges, and blues or create a brooch, bracelet or neckpiece with a lovely sherbet-colored palette of spinels. 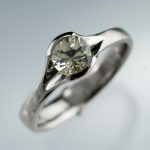 Thinking about using your birthstone as an engagement stone? This stone will still be around for your 50th anniversary. Something to celebrate this month for your birthday! 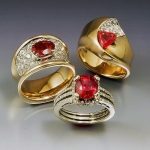 Three rings set with fair trade rubies from Malawi. Photo courtesy Trios Studio, Lake Oswego, Oregon. Nothing says romance like gemstones. But the gemstone story is not always a pretty one. At the mining and manufacturing end there is environmental degradation, child labor, death from silicosis, low wages, dangerous working conditions. For wholesalers, retailers, and consumers, an uncontrolled supply chain can allow treated, adulterated, imitation, and synthetic materials to masquerade as naturals, creating distrust among buyers and lawsuits against suppliers. The good news is that millions of “Millennials,” those socially and environmentally aware consumers born in the final decades of the 20th century, are having a tremendous impact on consumerism by demanding that same level of ethical commitment from retailers. Even though many Millennials have not reached their strongest buying years, they’re already willing to pay a premium for responsibly sourced—often called “fair trade”–products, such as coffee, chocolate, and beauty products. Pink 1.16 ct. sapphire. Photo courtesy Crown Gems. Montana green sapphire. Photo courtesy Nodeform. 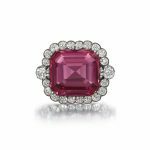 Responsibly sourced gemstones can also meet the ethical standards of anyone concerned about environmental and social issues, and return to gemstones, such as ruby, the romance they deserve. Washing Pit, Sri Lanka. Photo courtesy Crown Gems. It’s a tall order to change an entire industry, but gemstone wholesalers and retailers are doing what they can in a variety of ways. Columbia Gem House, one of the first to promote responsibly sourced colored stones, partners with the Chimwadzulu Nyala ruby mine in Malawi. All rough goes to a top-quality cutting house in China that shares their ethical values. By paying above average wages, CGH decreases turnover, and raises worker skill levels over time and, as a result, the quality of the final product. 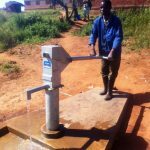 To give back to the producing communities, CGH participates in projects in nearby Ntcheu, Malawi, that raise the quality of services there. Well, partially funded by Columbia Gem House, Ntcheu Malawi. 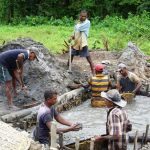 Crown Gems, a British-Sri Lankan joint venture, provides a transparent gemstone channel from their own mines in Sri Lanka, or those they trust to use mining practices with less detrimental effect on the environment. They partner with, and oversee the work of small, independent cutters, ensuring that quality cutting is done in safe, well-maintained environments. Ethical Jewellery Australia Pty Ltd, offers only Australian and Canadian diamonds to their retail domestic market. They buy colored gemstones only from artisanal Australian gem miners and cutters, or suppliers who have strict, transparent guidelines for sourcing and processing. 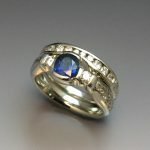 Fair trade sapphire and diamond ring. Courtesy Trios Studio, Lake Oswego, Oregon. Owners of the US-based Trios Studio, in Oregon, educate their clients year round about fair trade gemstones. However, a special, in-store event once a year spotlights the stones and draws enthusiastic customers who appreciate knowing a percentage of the proceeds goes to support community projects in Ntcheu, Malawi. They’ve developed such a name that customer seek them out via the Internet. 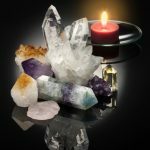 The interest in responsibly sourced gemstones extends beyond the mine into the laboratory, making lab-created gems–Moissonite, sapphire, emerald, and ruby—a viable option for consumers, too. 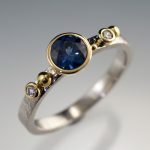 Designers, such as Konstanze, of Nodeform, and Tamara McFarland, of McFarland Designs, offer consumers the option of buying lab-created gems even for that time-hallowed purchase, the engagement ring. Sapphire and diamond ring. Photo courtesy Nodeform. Romance and responsibility. A match made in heaven. Eden Beach customer jeweler, Cassie Franklin, is risking it all to save her business from greedy realtor, Carla Towne. But when Tate Garner, handsome owner of the exciting new restaurant around the corner, walks in, she discovers that the biggest risk will be falling in love.